easter bunny cookies | what is clara eating today? This is a simple recipe for cut-out cookies. You can use any cookie cutter to fit the occasion. I make several batches and keep them in the freezer for a quick snack option. The best way to keep them is after rolling them out into 1/4-inch tickness. Then all you have to do is cut out a shape and bake! Also, don’t throw out the scraps after cutting out the shapes. Make them into different flavors and colors (using Crystal Light juice mix or DaVinci Syrup) and keep them in the freezer, so it will be easy to decorate the cookies next time you bake them. Mix the wet ingredients and add to dry mixture. Mix well. Place the sticky dough on parchment paper. Fold the parchment paper in half to cover the dough and roll out to 1/4 inch thickness. Place in freezer for 20-30 minutes. Peel off from the parchment paper and cut out cookie shape using a cookie cutter. 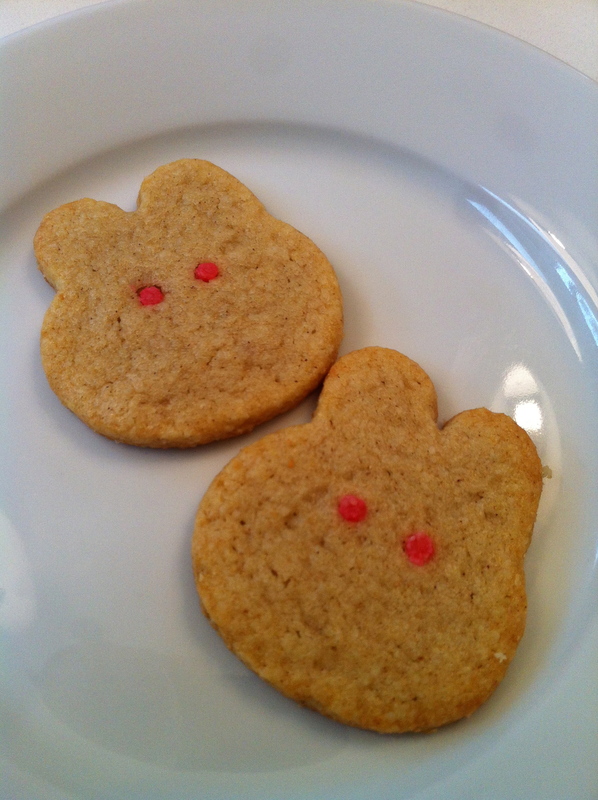 For the bunny eyes, i used the scrap dough and added little bit of crystal light juice mix to get the pink color. Then added little dots. Bake at 320C for 6-8 minutes until the edges start to brown. Cook completely on wire rack and store in air tight container.